We’ll be off to Yellowstone soon for the Spring Bear and Wolf Discovery, and I’ve been reading up on these apex predators. You get to be an apex predator (like me) if you have no predators of your own and are at the top of the food chain. But enough about me – the bear and wolf are a lot more interesting. They are also known as keystone species, which includes some subcategories. Let’s start with the grizzly bear, who is an ‘ecosystem engineer’. Why the cool job title? Because he transfers nutrients from one ecosystem (salmon from streams) to another (leftover salmon in the forest). They’re basically fertilizing the forest. The wolf is a keystone predator, and her prey is the elk. She will kill on average 22 elk per year, and this benefits a whole bunch of other animals who scavenge off of wolf kills, including eagles, ravens, coyote, black bear, and our friend the grizzly. The grizzly really does well here; he might show up a short time after a wolf pack dispatches an elk, and pretty much eats the whole thing. Both of these guys also impact the ecosystem more generally with their apex predator ways, described in the ‘trophic cascade’ theory. We’ll get to that next. I find this whole thing fascinating. 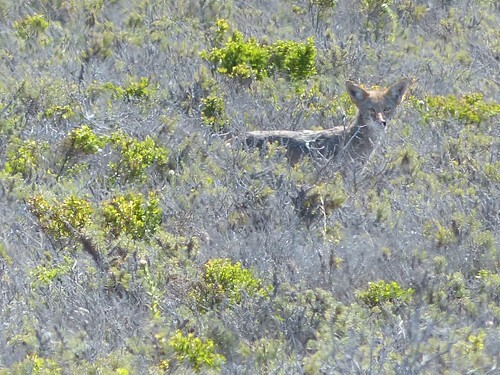 Here’s a coyote at Montana de Oro. He’s an apex predator for now, as long as he stays near the coast where the people are. Back in the hills he’s prey for the mountain lion and black bear.